It was another gorgeous morning in Boston, but definitely a little cooler that yesterday – perfect running weather! I encountered many signs of spring on my run. 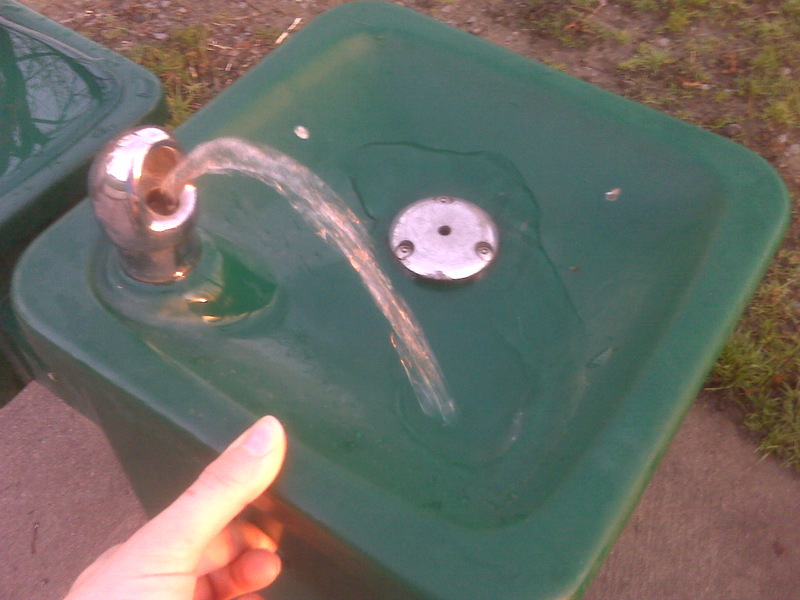 The water fountains work again! 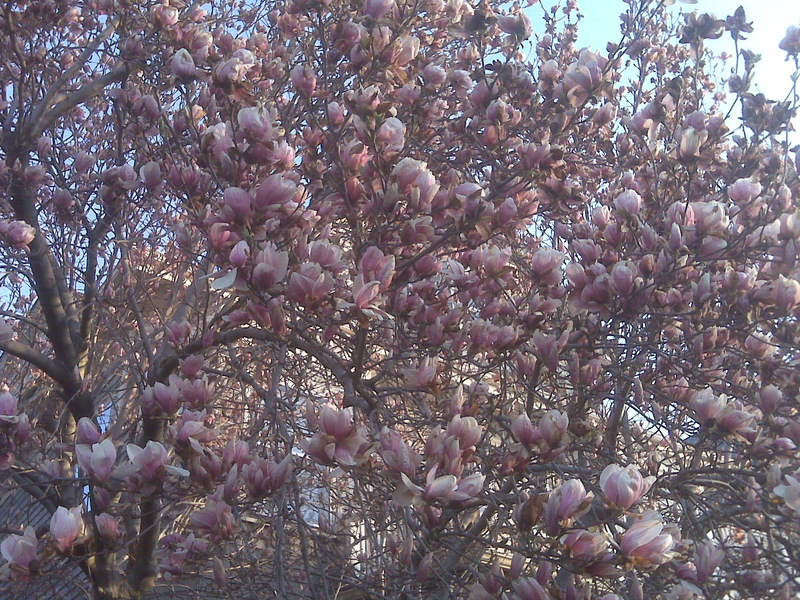 And, blooming flowers on trees! It was a great 7 mile run in the sunshine! I finished 7.28 miles in 60 minutes. 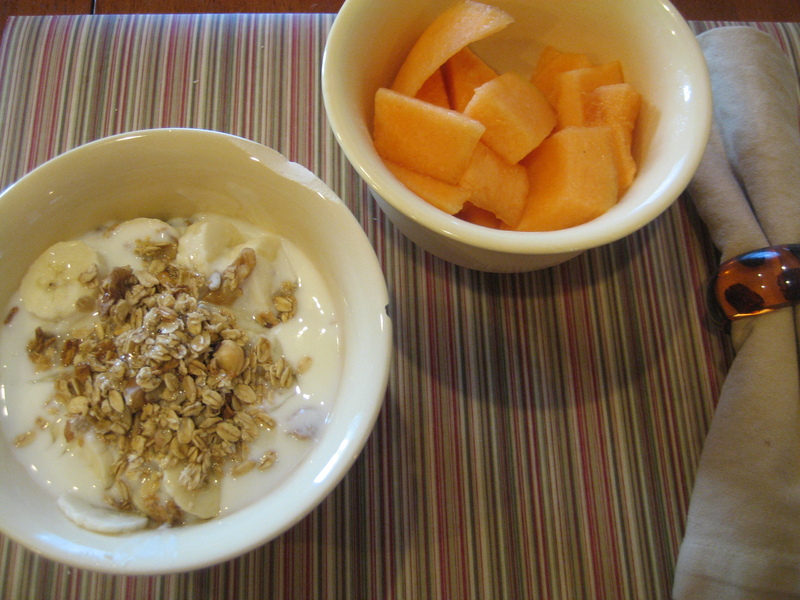 Then, I dug into breakfast – cereal with fruit and yogurt. 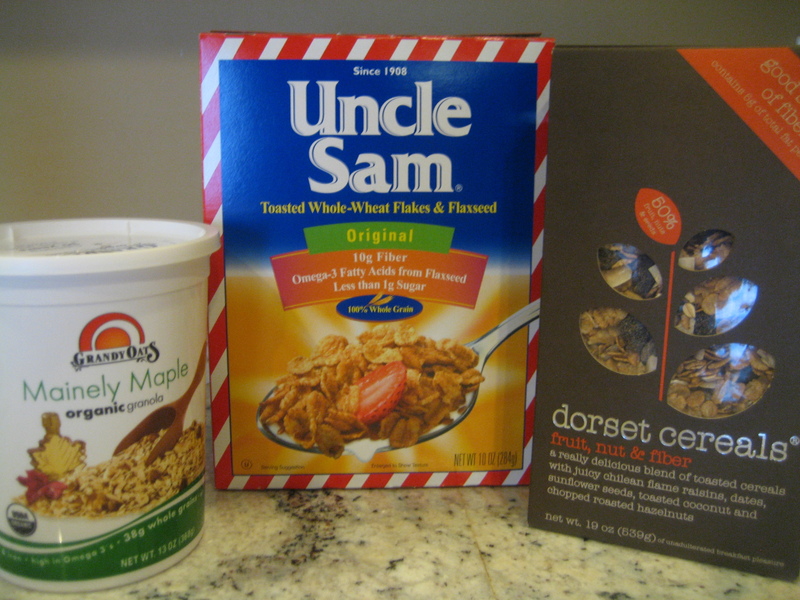 My concoction contained 3 different cereals – Uncle Sam’s, Museli & Granola. 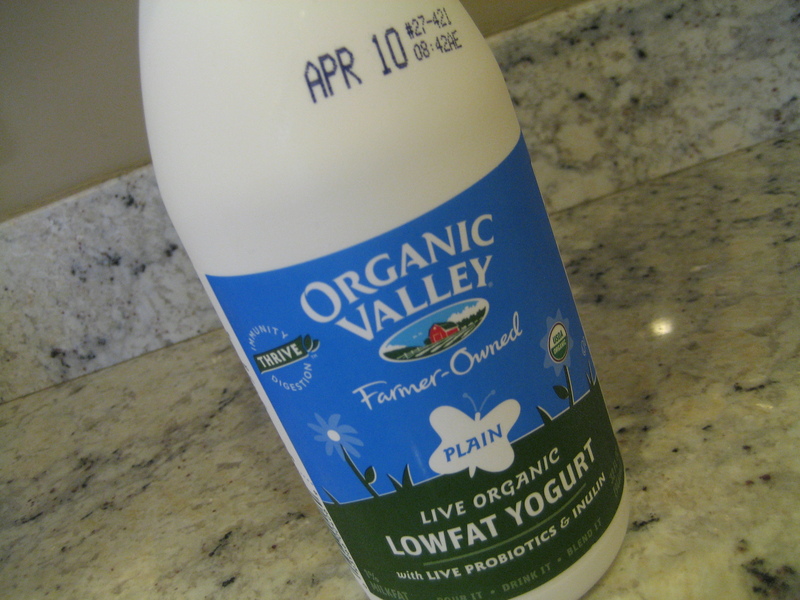 And, instead of yogurt, I tried this drinkable yogurt this week. 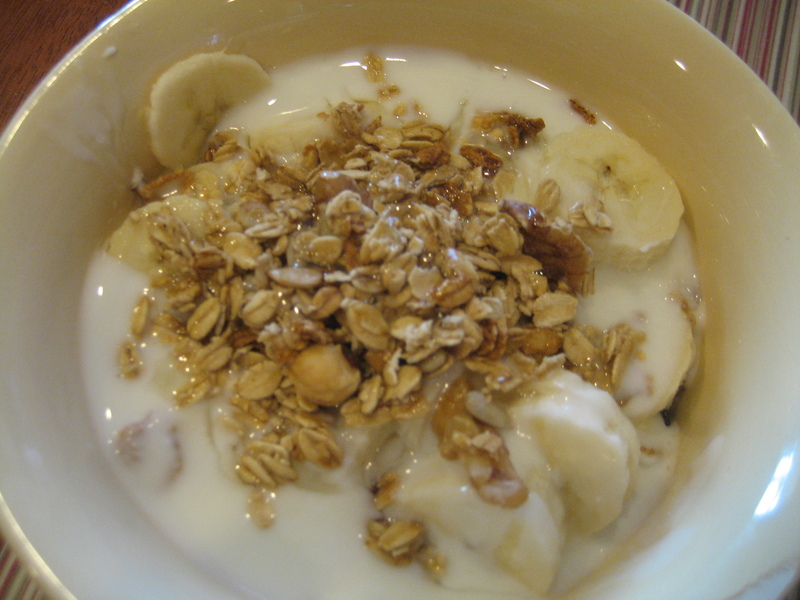 It is between a milk and a yogurt. I enjoyed it. I liked the change. I think it is like Kefir, but I am not sure. 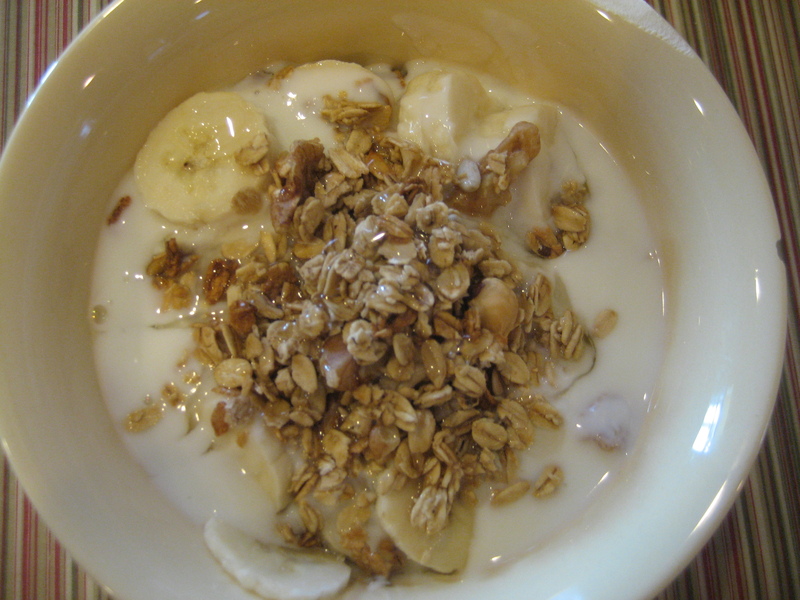 Cereal underneath, with granola and banana on top. Lunch was another salad that I threw together. It had random flavors, but worked together really well! 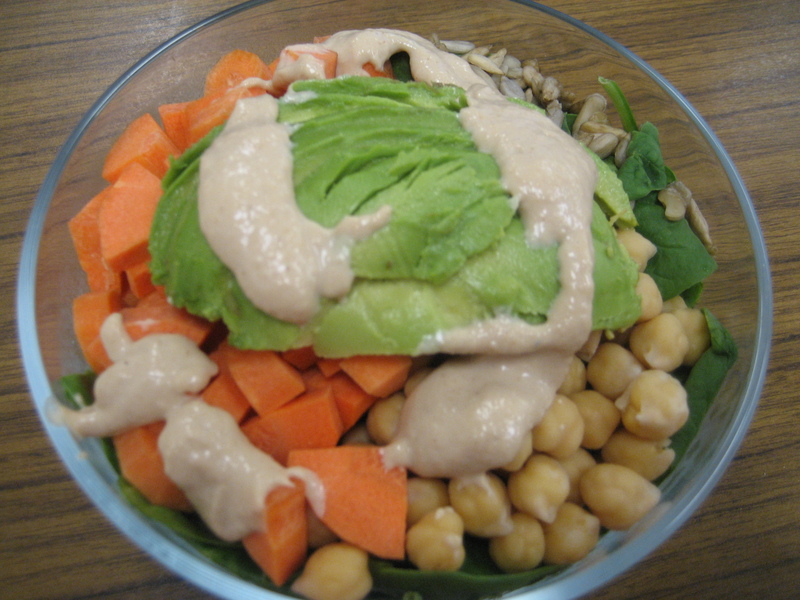 Baby spinach with carrots, chickpeas, kaia foods sprouted sunflower seeds, avocado and tangy tahini dressing. Remember a few days ago when I said I didn’t like to eat carrots raw? Well, I still don’t love them, but they worked ok in my salad today. 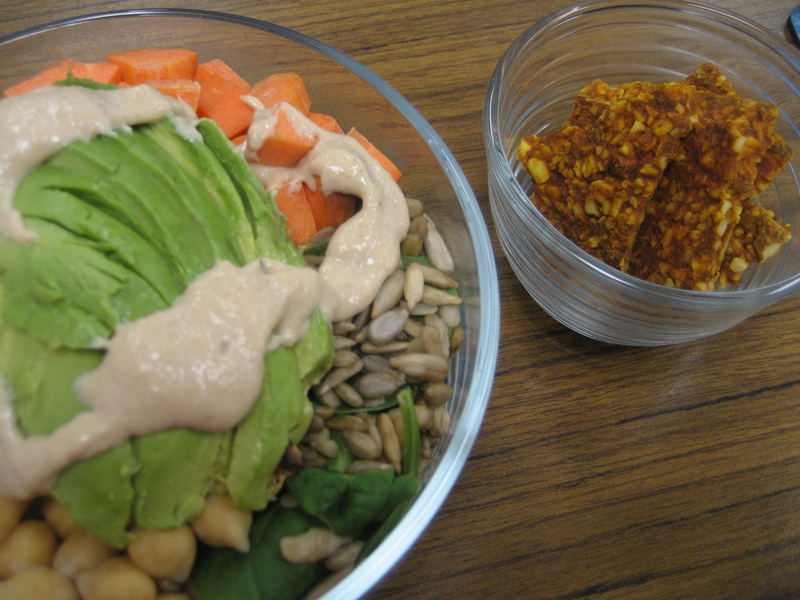 I liked having something crunchy paired with the creamy avocado and dressing! I try to get a variety of colors and veggies into my lunches, so the carrots worked today. This salad was so easy to throw together – I had chickpeas in the fridge, had chopped up the carrots and pre-washed my spinach over the weekend. Last night as I was packing my salad, all I did was throw the different components into my bowl. I topped it with 1/2 an avocado when I was ready to eat lunch. See – it IS easy to eat your greens and have a well balanced lunch! With a side of Cheese-y Quackers! 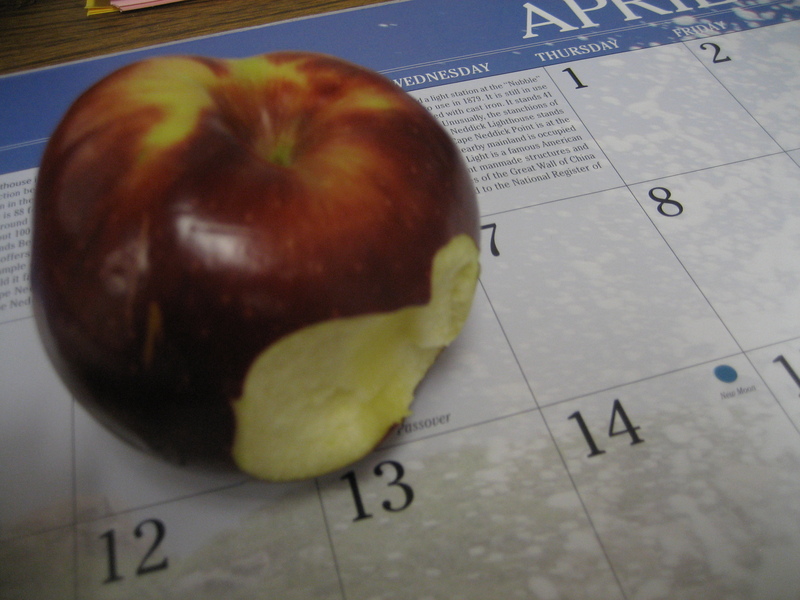 Later on, I snacked on a granola bar and an apple. 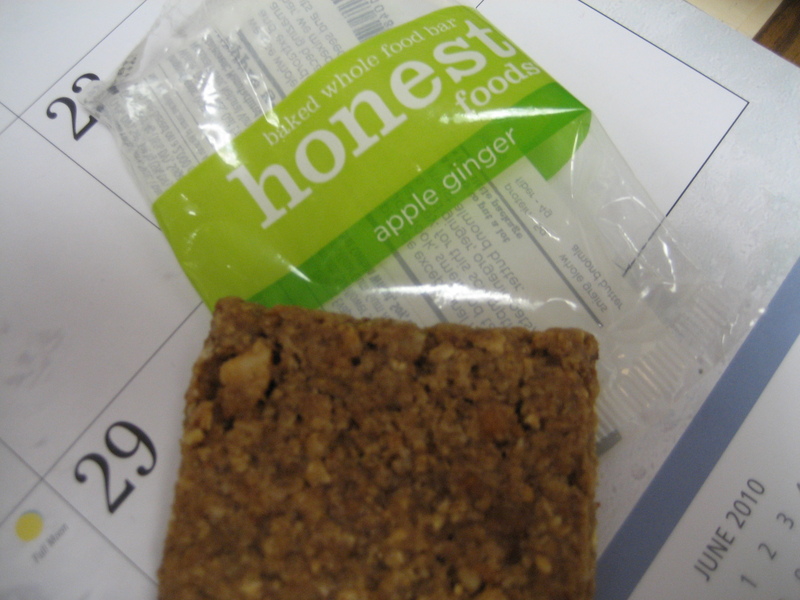 Love these Honest Food Bars! They taste fresh and chewy and REAL! There ingredient list is small and stuff that you will know, and they are made with almond butter. Then, dinner was out! 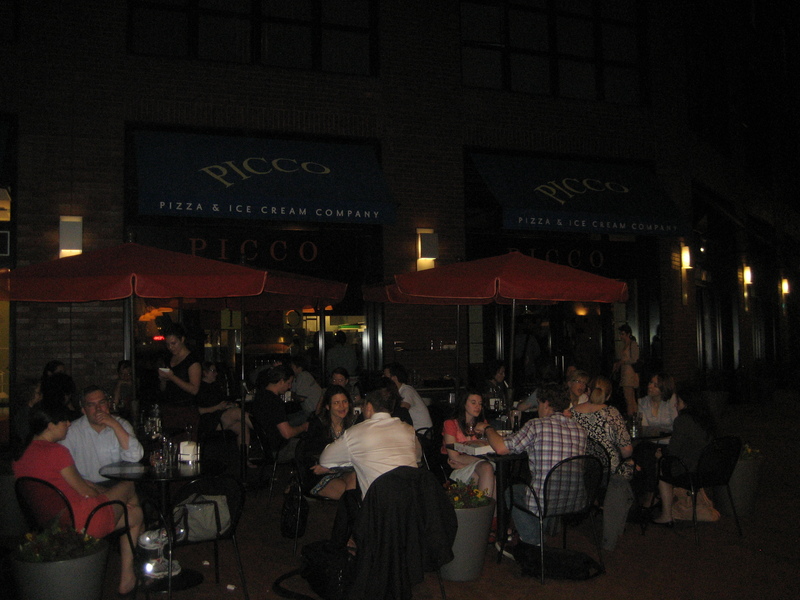 At PICCO (Pizza and Ice Cream Company) in the South End! It was so warm in Boston today – it reached 90° – that they tables were set up outside. But, we sat inside! This is a great restaurant. 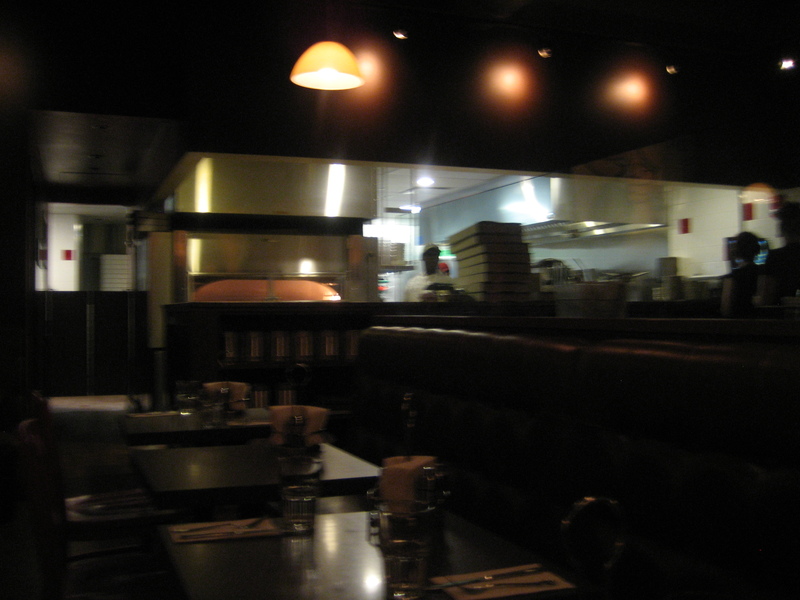 It looks like an old fashioned pizza parlor – I loved the atmosphere. You can see into the kitchen, which is awesome because you can see everything the chefs are making. It is all made to order. I started with an Allagash White – it was a beer kind of day. 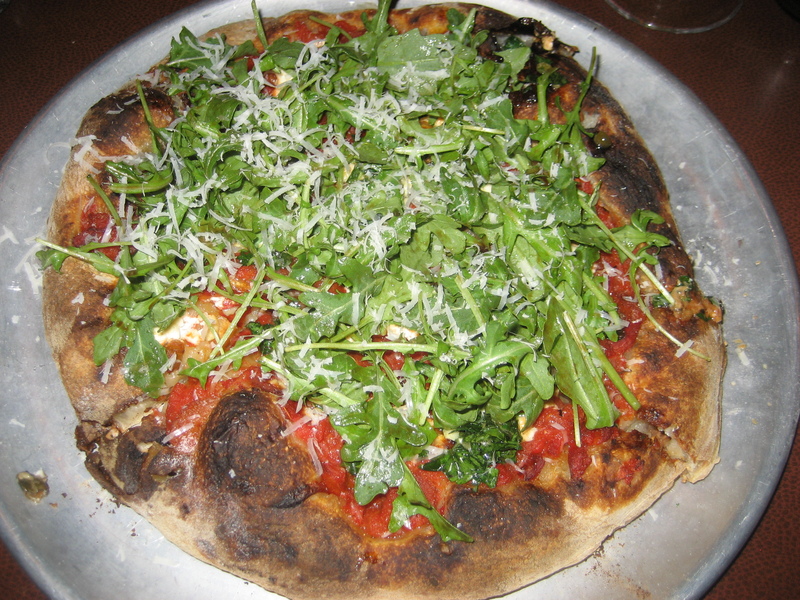 Then had the Red Pepper, Arugula & Goat Cheese Pizza. Chopped tomatoes, salsa verde & organic arugula salad tossed with aged Manodori balsamic vinaigrette. This pizza was awesome! The crust was crispy, but still chewy on the inside. 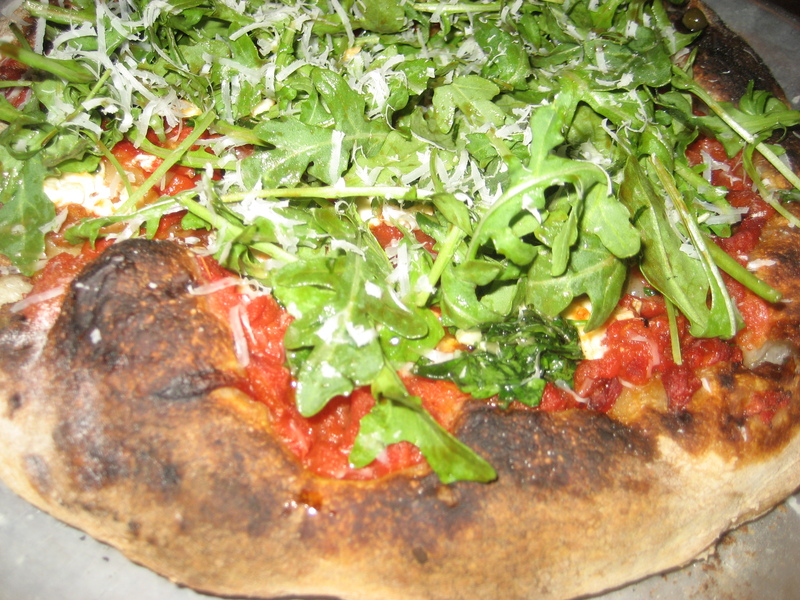 There was just enough goat cheese and the arugula was a great touch. I ate 2.5 pieces – yum. 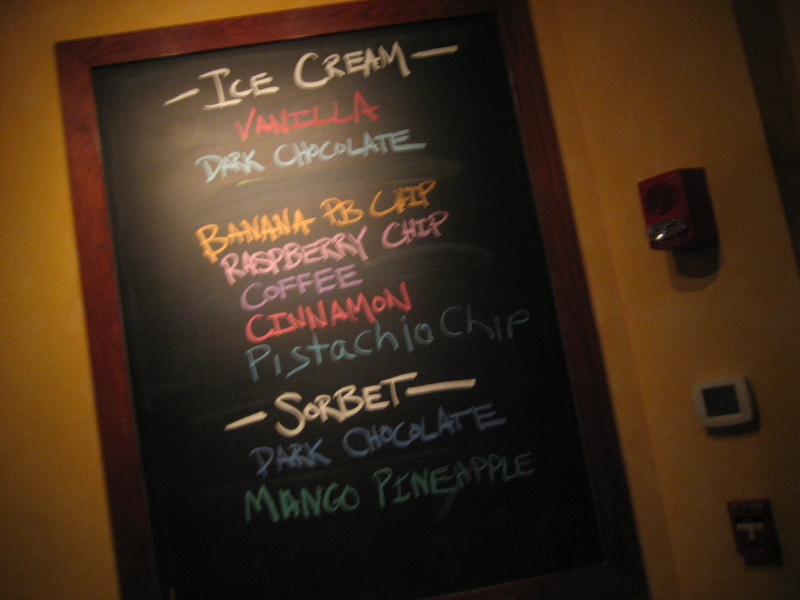 After dinner, it was time for homemade ice cream! 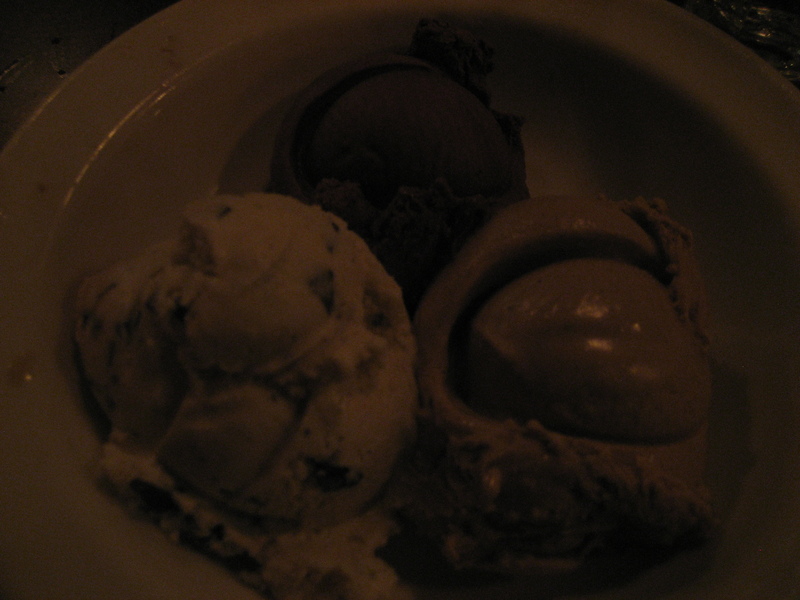 Brant and I split the ice cream sampler with 3 flavors – Dark Chocolate, Pistachio Chip and Coffee. So good – rich, creamy and delicious. The dark chocolate was definitely my favorite, but the others were great as well. Now, I’m stuffed and it’s time for bed. Good night! LOVE the sun rising picture! Congrats on that run time Jen! I recently made a recipe with Tahini and found it surprisingly hard to find. Did you go to Whole Foods? I sometimes have trouble finding tahini too – it is usually with the peanut butter in the natural foods section of grocery stores. I have bought it at whole foods and stop & shop / shaws. 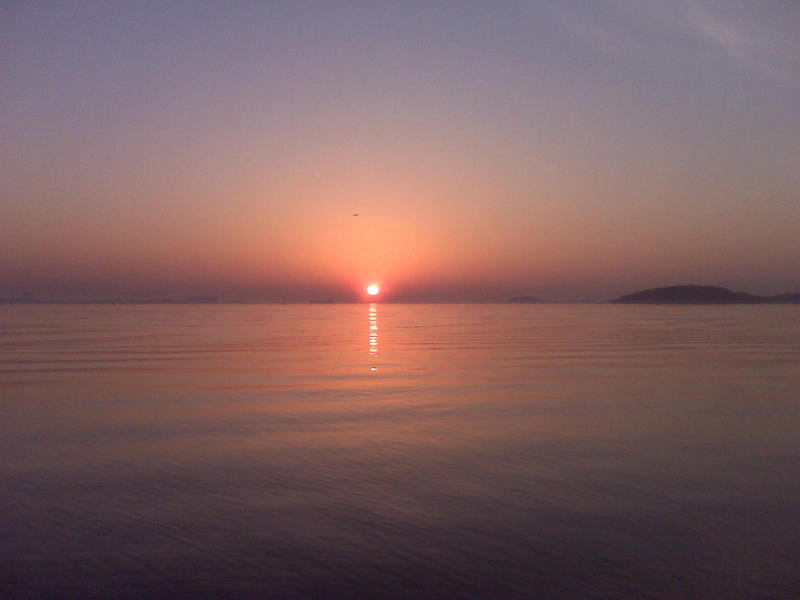 Wow…that sunrise is beautiful! I could run to that everyday!